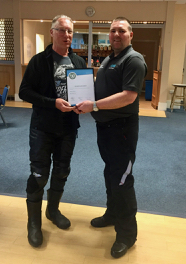 Mr Richard Dudley receiving his framed certificate from Group Chairman Stephen Carr. Many congratulations on your achievement Richard. And well done to Geoff Salt for getting you ready for your test!